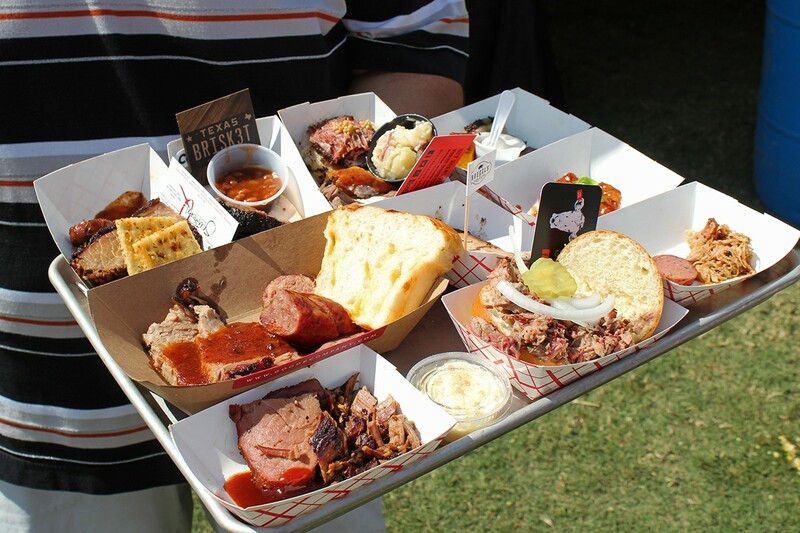 Smoked meat samples and other goodies abound at The Woodlands BBQ Festival. Photo by Scott Sandlin. 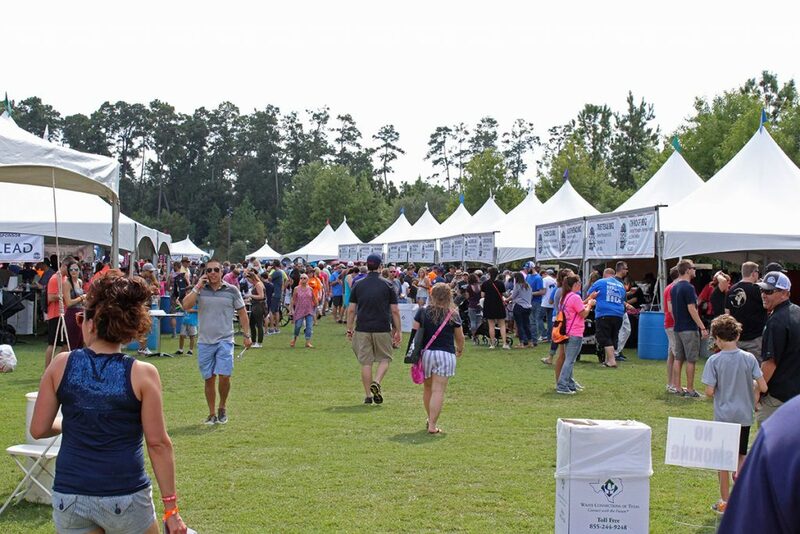 The third annual The Woodlands BBQ Festival returns Sunday, October 7 to one of the best barbecue festival venues in the Greater Houston area with smoked meat goodness, cold beer and live music. The event takes place from 1 to 4 p.m. at Town Green Park in The Woodlands on Lake Robbins Drive. Four acres of lawn provide ample room for guests, sponsor vendors, covered seating, activities for the kids and a strong contingent of some of the most talented and recognized barbecue pit masters from the Houston area and beyond. Tickets are $50 for general admission, which includes entry to the festival and all-you-can-eat sample portions from the participating barbecue joints. VIP tickets are $100 and include entrance one hour early, two drink tickets, a festival t-shirt and a tote bag. Purchase tickets here. Kids 12 and under are free. Pro tip: follow the participating barbecue joints on their social media accounts where some have discount codes to purchase tickets for up to 15 percent off the regular price. 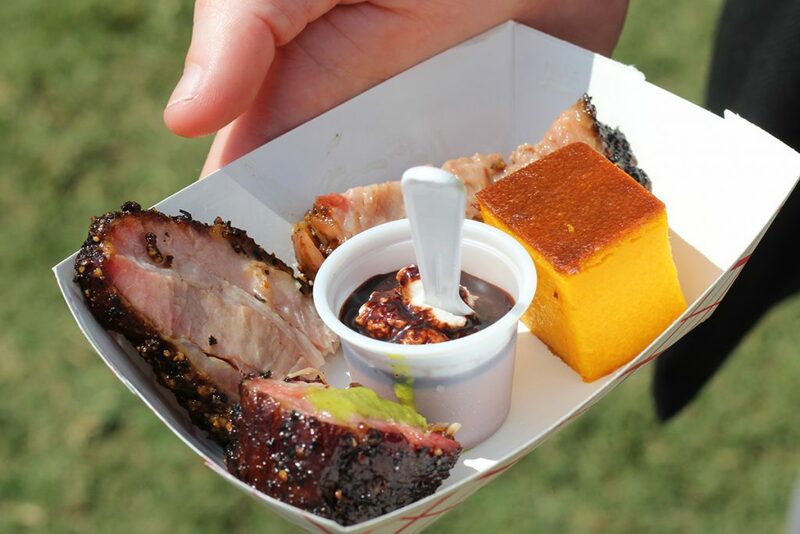 The Woodlands BBQ Festival returns for its third year at Town Green Park in The Woodlands. Photo by Scott Sandlin. This year’s lineup of sixteen prominent pitmasters includes returning Houston area barbecue favorites BBQ Godfather, Blood Bros. BBQ, CorkScrew BBQ, Goode Company BBQ, Harlem Road Texas BBQ, Roegels Barbecue Co., Southern Q BBQ, Spring Creek Barbeque, Tejas Chocolate + Barbecue, Tin Roof BBQ and Victorian’s Barbecue. The newcomers include Brotherton’s Black Iron Barbecue of Pflugerville, Daddy Duncan’s BBQ of Katy, Feges BBQ of Houston, Reveille Barbecue Co. of Magnolia and Willow’s Texas BBQ of Houston. Sample from Tejas Chocolate + Barbecue from the 2017 Woodlands BBQ Festival. Photo by Scott Sandlin. To provide some background on this year’s new participating pitmasters, John Brotherton of Brotherton’s Black Iron Barbecue is highly regarded in the Austin area for his team’s creative recipes using various smoked meats, such as their smoked brisket banh mi, pork rib pastor, and brisket guisada. Randy and Sylvia Duncan of Daddy Duncan’s BBQ ply their wares in the Katy area and beyond from their barbecue trailer for catering events and popups. (Their braised barbacoa tacos I tried earlier this summer were some of the best I’ve ever had.) Notably, Daddy Duncan’s BBQ also recently took home the Judge’s First Place Award and the People’s Choice Award at the 4th Annual Houston Barbecue Throwdown. 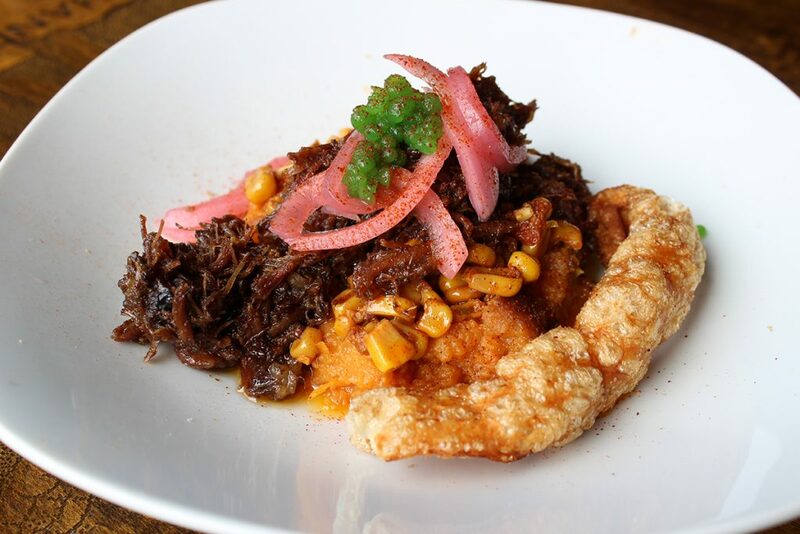 The winning entry from Daddy Duncan’s BBQ at the 4th Annual Houston Barbecue Throwdown, smoked beef cheek barbacoa with sweet potato mash, chorizo and bacon street corn, pickled onions, habanero caviar, and fried pork cracklins. Photo by Scott Sandlin. Newcomer Reveille Barbecue Co., owned by James McFarland and Michael Michna, recently opened for weekend service out on FM 1774 near Magnolia. Some may recognize James from his time managing the pits during the week at Tejas Chocolate. Reveille has already earned a following for brisket, big beef plate ribs, housemade sausages and creative special dishes. 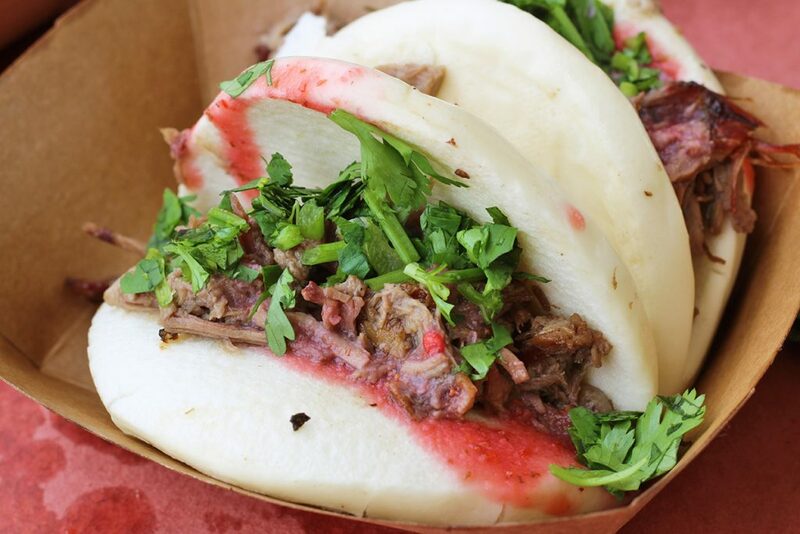 A recent special from Reveille Barbecue: leg of lamb smoked then wine braised, pulled and served on a steamed bao with a strawberry hot sauce and fresh mint. Photo by Scott Sandlin. Feges BBQ, owned by pitmaster Patrick Feges and his wife, chef Erin Smith Feges, started a barbecue restaurant serving breakfast and lunch in the food court at Greenway Plaza this past March. Both bring a culinary background to the project, with Patrick managing the meat-smoking duties and Erin developing recipes for more than a dozen of some of the most creative side dishes and desserts in Texas barbecue, such as Moroccan-Spiced Carrots and PB&J Chocolate Cake. Willow Villareal and his fiancé Jasmine Barela recently moved a few hundred yards to the west and are now serving at Shady Acres Saloon in The Heights. Willow’s prowess at the pits has earned the attention of barbecue aficionados across the area and beyond, and he consistently delivers some of the best smoked brisket anywhere. 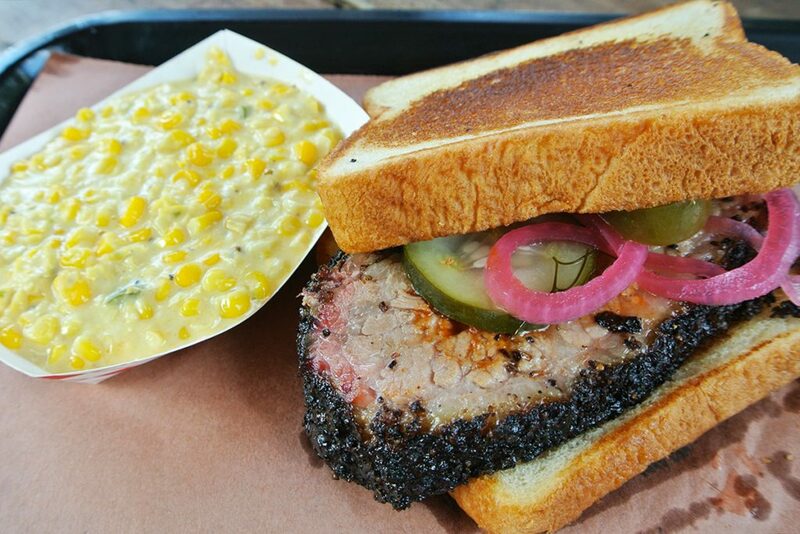 Sliced brisket sandwich from Willow’s Texas BBQ, served on griddled Texas toast, with a side of spicy cream corn. Photo by Scott Sandlin. Musical guests scheduled to perform at this year’s festival are Austin-area contemporary country artist Bri Bagwell and country music artist Wynn Williams of Weatherford, Texas. The Woodlands BBQ Festival is a community partnership between Stibbs & Co., P.C. and The Woodlands Area Chamber of Commerce. All ticket, drink and raffle sales from The Woodlands BBQ Festival benefit the Pulmonary Hypertension Association (PHA). PHA’s mission to extend and improve the lives of those affected by pulmonary hypertension. Ticket purchases help to take a step closer to a world without PHA. For more information and a link to purchase tickets visit The Woodlands BBQ Festival website and be sure to follow them on Facebook, Twitter and Instagram to get any last-minute updates as the date of the event draws near. 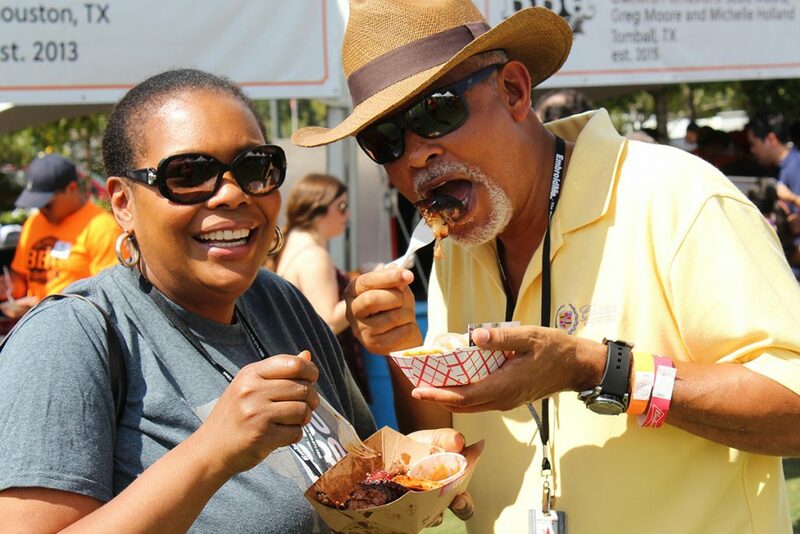 Everyone is happy when they get to go to a barbecue festival! Photo by Scott Sandlin. About The Author: Smoked meat enthusiast Scott Sandlin authors the Texas Pit Quest blog, maintains the Guide to Houston-Area BBQ map, and is the barbecue columnist for Houston Food Finder.